A Litchfield Park boy defied all the odds and took his first steps this week, walking into the hearts of the internet. The breakthrough moment for the toddler went viral. LITCHFIELD PARK, Ariz. — A Litchfield Park boy defied all the odds and took his first steps this week, walking into the hearts of the internet. Braxton, who will turn 2 years old this December, has hydrocephalus– commonly called water on the brain, but his mother Alysa says that doesn't define him. According to the Mayo Clinic, hydrocephalus is the buildup of fluid in the cavities of the brain. It causes brain damage, vision problems and cognitive delays or problems with walking or talking, among other things. 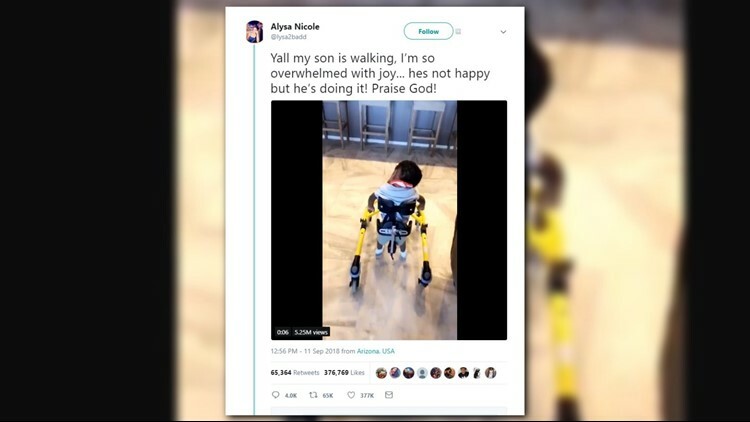 On Tuesday, Alysa posted a Twitter video of Braxton taking his first steps. The breakthrough moment for the toddler went viral. As of Thursday, the video had been retweeted more than 65,000 times and like over 376,000 times. Alysa has set up a GoFundMe to help pay for Braxton's medical costs.